This is a traditional Maharashtrian dish made from Red Pumpkin (Kaddu). There are different recipes of Gharge. This one is using wheat flour. This is mild sweet preparation generally eaten as main course (along with the meal). But you can have it as tea time snack as well. 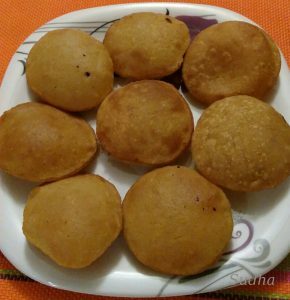 Some call this Bhopalyachi Puri. 3. Add Crushed Jaggery, salt, mix and cook till Jaggery melts. Keep stirring all the time. If you cook longer then Puris will be hard. 5. When the mixture is warm, add about a cup of wheat atta each and mix. Add Cardamom powder. Keep adding a spoonful of wheat flour till you bind a medium stiff dough. Do not add water. Sometimes pumpkin releases more water, in that case you may need more flour. Keep the dough for 15-20 minutes. 7. 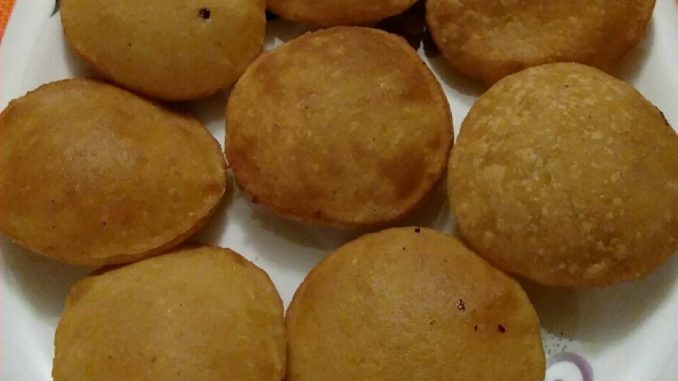 These puris can be eaten hot or cold. Serve with desi ghee / clarified butter.